Photosat: Public Domain Credit(s): NASA/GSFC/MITI/ERSDAC/JAROS, and U.S./Japan ASTER Science Team. 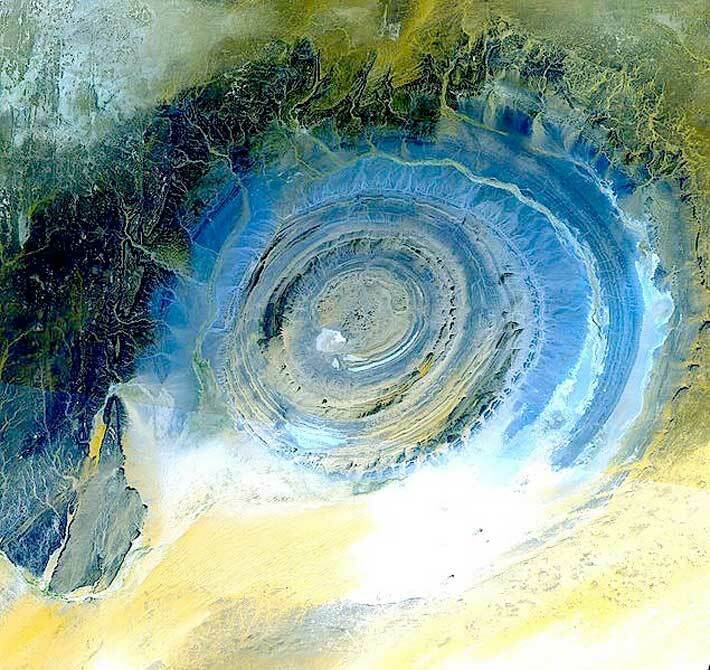 The Richat Structure, also known as the Eye of the Sahara or blue eye of Africa, is a prominent geological circular feature in the Sahara desert in Mauritania near Ouadane. It is nearly 50 kilometers across and very visible from space. Initially interpreted as an asteroid impact structure because of its high degree of circularity, and then as a structure formed by a volcanic eruption that also seems improbable because of the lack of a dome of igneous or volcanic rock, it is now argued to be a highly symmetrical and deeply eroded geologic dome that collapsed. So it is now thought by many to have been caused by uplifted rock sculpted by erosion. 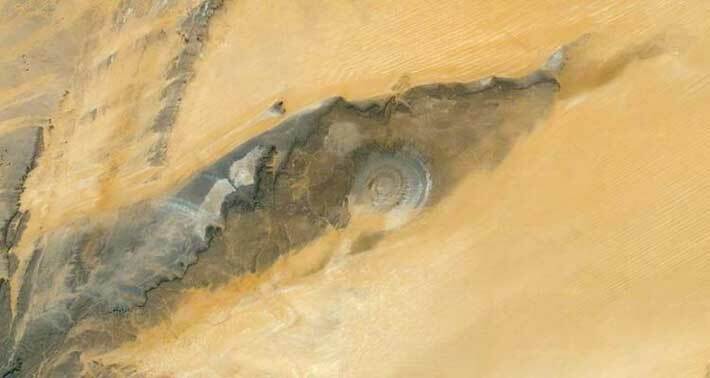 But the fact that the "rings", are equidistant to the centre and that the Richat Structure is nearly circular remains a mystery. It is an interesting point of view anyway and deserving more research. I wanted to go there for 3 years now but the area is too dangerous for the moment. I think the first thing to do is to investigate is the depressed corridor accessing to the "eye" from West. It is a possible ancient canal or delta for me and the only access to the Atlantic Ocean. It is much more easy to get results there because the "eye" suffered alot of collapsing and geologic changes that is making discoveries difficult.For the moment geological data are saying :"According to field mapping and aeromagnetic data, the gabbroic rocks form two concentric ring dikes. The inner ring dike is about 20 m in width and lies about 3 km from the center of Richat Structure. The outer ring dike is about 50 m in width and lies about 7 to 8 km from the center of this structure. Thirty-two carbonatite dikes and sills have been mapped within the Richat structure. Atlantis main Island according to the text of Plato in Timaeus & Critias written in 360 BC. The dikes are generally about 300 m long and typically 1 to 4 m wide. They consist of massive carbonatites that are mostly devoid of vesicles. The carbonatite rocks have been dated as having cooled between 94 to 104 million years ago. A kimberlitic plug and several sills have been found within the northern part of the Richat structure. The kimberlite plug has been dated being about 99 million years old. These intrusive igneous rocks are interpreted as indicating the presence of a large alkaline igneous intrusion that currently underlies the Richat structure and created it by uplifting the overlying rock". So we are talking about a 100 millions years ago geological structure, we have to keep in mind this, but if old stratas were uplifted it is normal. And we get extensive hydrothermal alteration of rhyolites and gabbros and a central megabreccia created by hydrothermal dissolution and collapse there too. 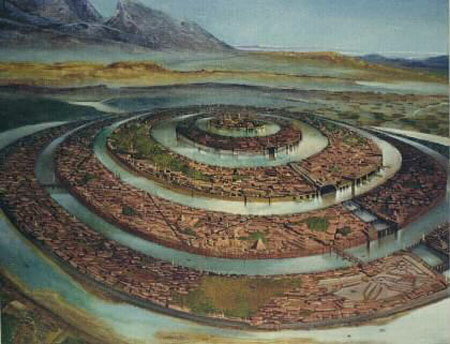 We know also that 40000 years ago it existed huge lakes in Sahara. We know that Sahara was still with some humidity 6500BC. Sahara desert covering ten countries of Africa with 9,400,000 square kilometres was 100 Millions of years ago all covered by sea. So in any case I think that this is a research that deserve alot of attention. Martinez-Frias, J., Rull, F., Martín-Redondo, M.P., Delgado, A., Fernández-Sampedro, M.T., García-Talavera, F., López-Vera, F. and Menor Salván, C.(2011)Multianalytical characterization of silica-rich megabreccias from the proposed natural area of Richat (Sahara desert, Mauritania). Research Journal of Chemistry and Environment v. 15, no. 3, pp. 49-54. 2. http://www.youtube.com/watch?feature=player_embedded&v=pTTnYRaZ55A French video with animations by geologists. 3. Nemiroff, R., and J. Bonnell (2002) Earth's Richat Structure, Astronomy Picture of the Day, October ...Astronomy Picture of the Day, Michigan Technological University, Houghton, Michigan.